This is the June 30th 2017 (20170630) SP Flash Tool ROM for Doogee Mix. 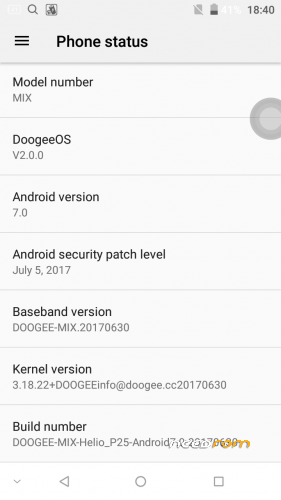 This is the official ROM as posted by Doogee. Tested and working great on Doogee Mix. Note, you may lose your IMEI when flashing this ROM. See our thread for further help regaining IMEI. This ROM is for MT6757 P25 6GB ONLY. Gives me "scatterfile invalid" when trying to load the scatterfile in latest SP Flashtool. What to do? We’ve flashed this exact ROM and didn’t get this error. It’s direct from Doogee. You’re using 5.1724? If you continue to have issues, post in the thread linked above and will try to help further. I had to remove the chinese characters in the foldername of the rom. Everything went ok. Interesting. Thanks for the tip. Will put it in the Doogee Mix thread. For me is good and I have the 6g version.